The article reviews a new paradigm for the arrangement of settlement systems in Russia. It is proposed to cover the territory of Russia with linear settlement systems, basing mostly on the existing and planned railroads. The author believes that some of the railroads should be turned into large transport corridors, along which wide settlement corridors with cities, agricultural zones, plants, offices, universities, scientific centers, recreations, leisure centers, as well as zones of nature reserves can be organized. The main settlement corridor should be formed along the Trans-Siberian Railway. The author calls this railroad and the adjoining settlement corridor ‘Sibstream’. He proposed to start the Sibstream from the railroad ‘Petersburg-Moscow’ and then to go along the Trans-Siberian Railway. Besides, the article contains several proposals on arrangement of new transport corridors in Siberia, the North of the Arctic Circle, the Far East and Kamchatka, as well as along the railroads planned by the Russian Railways for the long term. Baburov, V. A. (2013). Gorod Solntsa [Sun City]. Galereya nedvizhimosti, 5. Khzanov, M., Lezhava, I., Shubenkov, M., & Mullagildin, R. (2003). Vologda – Sibstream team. Proposals for the International Competition of Sustainable Urban Systems Design. 22nd World Gas Conference, Tokyo. Lezhava, I. G. (2012). Rossia lineinaya [Linear Russia]. Gradostroitelstvo, 2. Lyubovny, V. Ya. (2013). Goroda Rossii: alternativy razvitiya i upravleniya [The cities of Russia: alternatives for development and management]. Moscow. Lyubovny, V. Ya., & Sdobnov, Yu. A. (2011). Moskva i stolichnyi region: problemy regulirovania sotsialno-ekonomicheskogo i prostranstvennogo razvitia [Moscow and the metropolitan area: the problems of management of social-economic and spatial development]. Moscow. Maloyan, G. A. (2004). Osnovy gradostroitelstva [Fundamentals of town planning]. Moscow. Pertsik, E. N. (2013). Geograficheskaya mysl: istoria, problemy, poisk reshenii [Geographical thinking: history, problems and search for solutions]. Moscow. Smolyar, I. M. (2004). Terminologichesky slovar po gradostroitelstvu [Terminological dictionary of town-planning]. Moscow. LEZHAVA, Ilya. Sibstream. 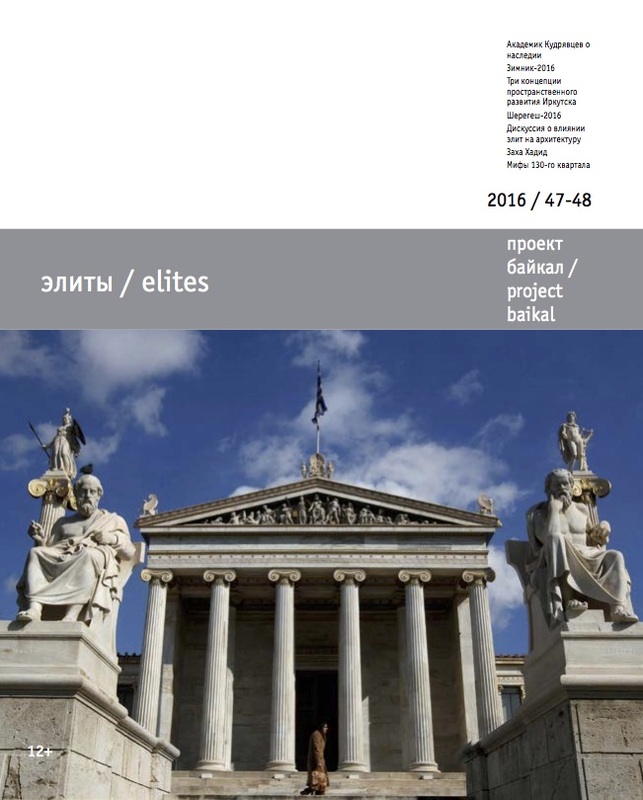 project baikal, Russian Federation, n. 47-48, p. 92-103, may 2016. ISSN 2309-3072. Available at: <http://projectbaikal.com/index.php/pb/article/view/1007>. Date accessed: 22 apr. 2019. doi: https://doi.org/10.7480/projectbaikal.47-48.1007.